Don’t Let the Turkeys Get You Down This Holiday Season! If Santa Clause needs to make a list, you certainly do. Shortly after I married I discovered that my habit of getting up every morning and making a list of things I needed or wanted to do that day drove my spouse nuts. Did I stop making lists? Nope. I just did it before he got up. There have been periods, however, where I felt I was too busy to make my list. And the results was physical, emotional and organizational disaster. My stress levels increased drastically as I found myself having to fix errors or backtrack because of things forgotten. Having a list — of things to do, to pack, to buy, et al — is a more efficient use of your mind and your energies, allowing you to focus on the goals and relax more knowing you don’t have to try and remember everything. The bonus is that you get an endorphin rush each time you are able to cross-off or eliminate items on your list! The keys to effective list making is to prioritize & keep it flexible by allowing yourself stretch room. This applies no matter what kind of list: to do, to pack or to buy. To prioritize, first simply make your list. Next review your list and decide which are the top 3 items are the most important things on the list, these are things that will have the greatest effect on your ultimate goals. Label the most important A1, the next A2, and the last A3. Now determine what are the next most important items on the list and label them accordingly B1, B2, B3, etc. Try to limit yourself to no more than 6 items for A, B, C or D categories, and really you should have no more than 3-4 A items. If you are concerned about missing a higher priority item amongst all the C and D items, don’t hesitate re-copy the list putting the A items at the top so you can’t miss them. Or alternatively, highlight the A items in some way. Along with big, bold A1, A2 and A3, I often underline or star these items so they really stand out on my list and remind me how truly important they are. Finally, be flexible and include some stretch into your list. We’ve all experienced that panic when we find something we thought would take only a few moments expands to take up a large chunk of our day. Or we’ve gotten to the store only to discover that something special on sale that would bring bigger smiles and greater pleasure. So you shouldn’t schedule every minute (even if you are an attorney or accountant) nor should you consider your list carved in stone. Always assess list against your larger purpose and adjust your list(s) accordingly. On your To Do list, don’t forget to schedule some time for a bit of mindfulness whether it’s 5- or 15-minutes of meditation, prayer, mindful walking, or simply reflecting on what is happening inside you and around you. Actually, this is a great way to reduce your stress and re-gain control over your mind and your actions whenever you find yourself caught up in a holiday frenzy. Whether it’s an eating, rushing or shopping frenzy, the sense of urgency and pressure should be a signal that you need to slow down, take a deep breath, reflect upon your priorities and larger goals and ask yourself if your current actions are in line with those goals. Even pausing for a deep breath or two has been found beneficial to reducing blood pressure, anxiety and stress. If you having trouble taking time to reflect, set an alarm on your watch or phone that acts as a reminder at least once or twice a day. Or schedule the time on your calendar, especially useful if you receive calendar notifications on screen. Take just 15-minutes before or after work (or even during lunch) to close your eyes, sit quietly — possibly with headphones on with peaceful music or sounds — and focus on your breathing, the tension in your neck, shoulders or elsewhere, and thoughts streaming through your mind. Perhaps you might want to imagine a peaceful, calm location or image that brings you joy. If you are wanting to save money for college or retirement or pay off your debt (and especially if you worry about basics like rent), is that 55” HD TV really moving you towards that goal? Is it really a “bargain” if you end up paying 15% interest on your credit card debt for another month or two? If your larger goal is increasing your spirituality and living your faith, check that your focus doesn’t end up on outward signs of religion or commercialization of your faith. If your Life Goal is to have a happy, healthy family, is the stress and conflict of high-pressure shopping (or decorating) working towards the goal? If your goal is to make a significant contribution in your life, would you do better to buy a dinner with all the trimmings and focus more on your work rather than spend hours gathering recipes, buying groceries and preparing a holiday dinner? Or would charity work and contributions during the season be more in line with your larger goals? It’s easy to lose sight of your goals during the holiday blitz of social pressure to become Martha or Jimmy Stewart, so find ways to remind yourself of those larger goals and determine how you can celebrate the season in a way that fits within your own purpose and desires. Write your larger goals on the top of your lists (you are making lists now, right?). Find a Holiday Buddy and check in daily (or at least weekly) to make certain you both stay on track of the larger purpose. Place Post-Its with those goals where you will see them throughout the day. Create your own motivational posters even. One woman I know created a custom wallpaper for her phone and computer screen that was a collage of things representing her larger goals as well as key words. Every time she felt pressured to pledge to bake a batch of cookies instead of succumbing to her cultural expectations, she paid a start-up catering business to do the baking. She helped another woman entrepreneur directly with the order (and indirectly by spreading the word about the business and its delicious work) which matched her personal life goal of helping other business women succeed. Since the caterer was a single mother, she got a double rush of satisfaction for also fulfilling her goal to help other single mothers like herself. And finally, with all the time saved she found more time to spend with her daughter and focus on increasing her own business sales. All in all, she had one of the best holiday seasons in her adult life. 4. Focus on the Positive! When we feel pressured and overwhelmed we tend to focus even more strongly on the negative, especially when we’re told we should be happy and joyful. Add the problem of sugar rushes and crashes, excess salt and possibly alcohol flooding our bodies, and is it any wonder why emotional and psychological problems surge during the Holiday Season?It takes at least 3 positive thoughts to break the hold of negativity. Biologically we are geared to focus on potential threats so we need to make an effort to keep the positive in mind. When you find yourself speaking or thinking negatively, quickly stop and think of at least 3 things that you are grateful for. Keep a Joy Log. Either online or in a journal, make note each day of at least 3 things you are grateful for or 3 positive things that have happened that day. Instead of the usual Advent or Hanukkah Calendar, why not create a Blessings Calendar and write down at least one thing you are thankful or grateful for in your life for each day of the Holiday Season? And don’t forget to remind yourself that this will all pass — and far more quickly than we expect. So make note and revel in all the joy of the season and accept the inconveniences knowing they will be gone soon. And now for some business-related tips. Despite what some businesses believe (yes, I’m talking to you Paypal, Amazon and Costco), inundating our target audience with a blizzard of promotions obviously for our own benefit doesn’t really win friends — or clients. But it is the best time of year to keep in touch. Make certain your information is up-to-date and accurate. If your website hasn’t been updated for awhile, now is the time to do so. Let customers and clients know of any seasonal sales, specials or events coming up. Also let them know of any changes you’ve made to the business such as adding new products or services, new staff. Check that your location, contact information, hours of operation, and other information necessary to make it easy for your target audience to do business with you is easy to find (preferably “above-the-fold”). If this isn’t your busy season, use this time to provide updated information such as frequently asked questions from the previous season or tips for preparing for the upcoming season. For example, landscape and gardening services often post tips on winterizing plants or caring for poinsettias. Perhaps you’ve had an epiphany about your industry and your clients or customers best interests. Share it. Or take this time to answer some the ten most frequently asked questions (like the after Christmas Return Policy) or dispel the most common myths. Retailers might want to provide a few tips to help customers reduce their own stress at this time of year, such as keeping gift receipts in one location in case someone needs to make a return or taking frequent breaks while shopping to rehydrate and rest their minds and their feet. Or you may want to offer up some suggestions like adding a pack of rechargeable batteries or a battery recharger with those electronic gifts to make certain it is truly a gift and not a money-draining burden on the parents. Think about the holidays from your customer or clients point of view and then offer up some helpful ideas. Restaurants might want to offer a Shopper’s Special Take-Away that includes a complete family meal for the harried. Or maybe hiring some extra staff to handle calls or improve checkout if you know you’re going to be busy. Then make certain you tell your audience about these useful (and thoughtful) benefits. I once worked with a small business that offered free delivery during the holiday season. The business owner grumbled that it wasn’t helping sales. A quick survey of the rest of the class made it clear a) it was a great feature that many class members would use but b) no one knew he offered it because he hadn’t promoted it! Take this time to say Thank You! It’s the time of year when we should be counting our blessings and thinking of — and thanking — others. Now if you can add a personal note and signature (even if it’s written by your assistant), a note that shows this is indeed about that person (perhaps a mention of the services rendered that year or a remark about the accomplishments of the clients or their children), this can be a wonderful way of building your relationship. For the more technically-oriented, consider individual Shout-Outs on social media. And don’t for the value of photos or videos of the past year’s events with images of happy clients, customers or staff. One lovely alternative to spending money on mass produced holiday cards, that make little impact except to have to be recycled or trashed, is a charitable donation of money or time, such as Heifer International, Finca, Giving Tree requests (particularly the larger ones for older children that often don’t get selected), a Habitat for Humanity project, or a shelter or refuge. Use large, bold photos to show the positive affect this donation is making on the world and let your customers or clients know, with posts on your website and social media, that your business could make this donation because of their support throughout the past year. I would like to take this opportunity to thank you for your support of our website and my work. 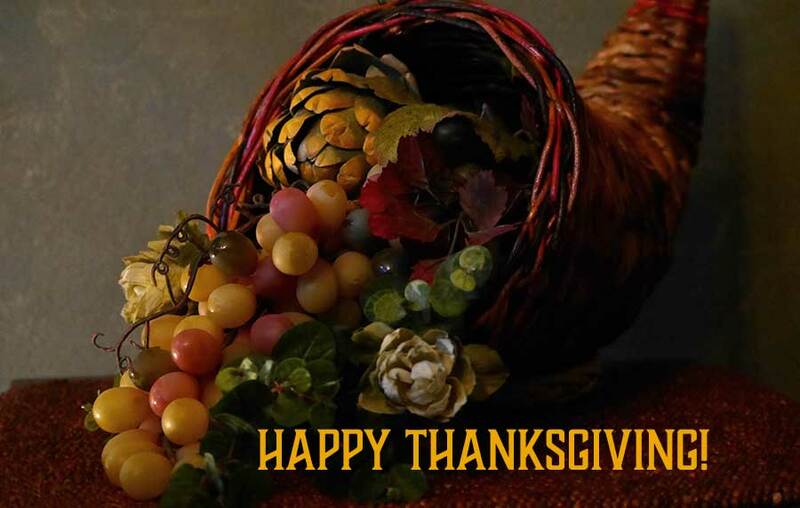 May your Thanksgiving Holiday be a joyful and happy one! p.s. Remember, you don’t have to be perfect, you just need to take positive action to make a difference. p.s.s. Case in point, competitive internet marketers would say I wasted my time by not tying in a click-through on this email. But I wanted to wish you all a Happy Thanksgiving and I’m on the clock as well, so please accept my apologies and keep an eye out on the site this coming weekend for a look at animal rescue you made possible and some news of plans for 2016.